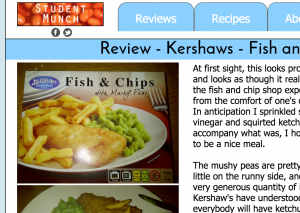 An independent food review site aimed at students; covering everything from tinned food to ready meals. Written in HTML5, CSS, object-oriented PHP and SQL. Plans to introduce a “Login with Facebook” feature in the future. Student Munch is marked up semantically so that it can be interpreted as a review by search engines. I use semantic markup so that my reviews can be indexed and displayed appropriately in search engine results. This site would work well as a WordPress site, but I don’t believe we should become reliant on third-party libraries and frameworks and should still learn how to do complex things manually. This has become an educational experience in which I have written code that allows me to upload review images (resized and condensed for high performance over slow networks), manage user accounts from the back end and automatically create search engine optimised URLs.